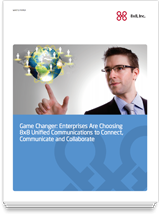 Cloud Unified Communications: A Total Game Changer | 8x8, Inc. Learn why enterprises increasingly are switching to cloud-based VoIP unified communications, for benefits ranging from cost savings to improved customer satisfaction to security, compliance and business continuity. Big wins include improved company unity, reduced management hassles and better support for mobile, global and distributed workers.